So I just went another work trip to Seattle and had the worst flight experience ever. Yes, I said ever. In all my years of flying, I’ve experienced cancellations and delays to no end, but this one blew my mind. I was supposed to get to seattle at 6:55PM. I arrived at 1:30AM. In all, I boarded the plane twice and exited the plane twice. Yes, it was only one flight. I guess I shouldn’t complain, since we did eventually make it, even if 6 1/2 hours later. 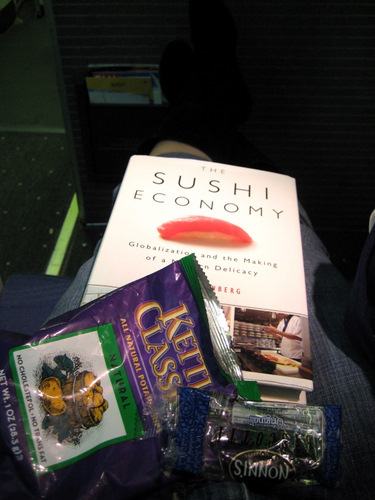 So during the first stint on the plane, where we probably waited for several hours, I finished reading the Sushi Economy. It was an excellent book and it makes me think just a bit more every time I have sushi now. It’s pretty complex and amazing how that tuna lands on your plate. All I had to eat were a bag of chips and a little biscotti. And this is only because I happened to be in first class. The coach people got bubkus. 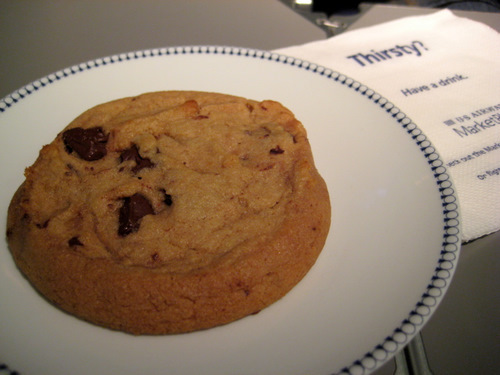 After being 6th in line for takeoff, then having to go back to the gate, getting off the plane, and getting back on, it got to be so darn late, 9PM actually, that everyone was cranky and starving. And on a Sunday night at 9PM in PHL Terminal A, there isn’t much foodage to be had. 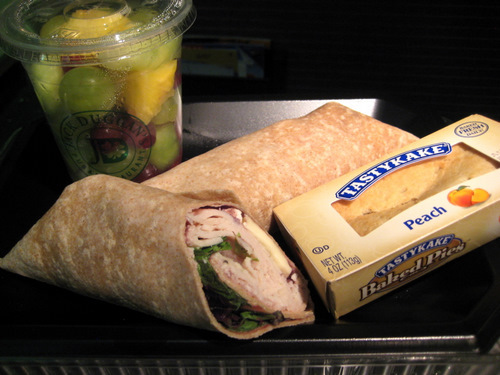 So I ended up going to some horrible place and picking up a wrap that was who knows how old, some fruit salad, and a tastykake pie. Ok, this pie was gross. I remember liking these back in the day, but I guess my palate has changed. The fruit salad was also terrible. The wrap actually was a nice surprise. It wasn’t the greatest, but it was definitely more than meets the eye. You’d think it was just a boring turkey wrap, but it was more like a thanksgiving wrap. There was turkey, some cranberry type of spread, and brie cheese! If it wasn’t for the fact that it was super old and the lettuce wilted and brown, the rest of it was quite fine. The brie was a lovely touch! Finally, probably at about 10 or 10:30 or so, we actually took off. Once airborne, the flight was flawless. It’s just the taking off part that always gets you. Much of the second hunk of waiting time was due to waiting for catering. 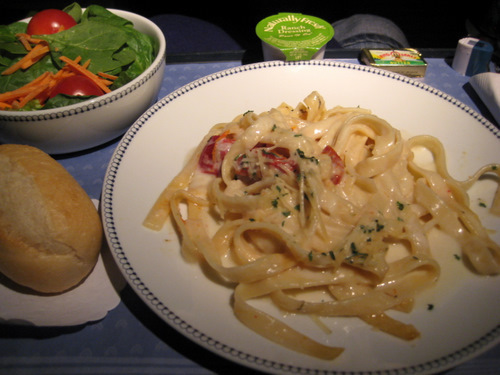 Again, since I was in first class, I did get fed a real meal. Coach people, if they were still hungry, could purchase a meal. Man, if I was in coach, and I had to purchase a meal after waiting for 6-7 hours, I would have blown my friggin my top. Anyhoo, I was lucky. It was a simple fetuccini alfredo with some roasted red peppers. There was optional salmon, but most of us opted out of it. It was fine! The salad was fine too and the warm roll was really good.